Mr William (Bill) Tweddell BA, BEc JCU MAICD was elected as Chancellor by the James Cook University Council for a five-year term, commencing on 26 March 2016. Mr Tweddell is the University’s fifth Chancellor, and the first alumnus to be elected to the role having graduated from JCU with a Bachelor of Arts (English Language and Literature) in 1972 and a Bachelor of Economics in 1976. In 2010, he was recognised as one of JCU’s Outstanding Alumni. Mr Tweddell has enjoyed a distinguished career in Australia’s diplomatic service spanning four decades. Most recently he served as Australia’s Ambassador to the Philippines from January 2012 to January 2016. Mr Tweddell was a senior career officer with the Department of Foreign Affairs and Trade. He has previously served as Head of the Americas and Africa Division of the Department in Canberra, as Australian Ambassador to Vietnam, Deputy High Commissioner to the United Kingdom, Consul General, Hong Kong and Macau, High Commissioner to Sri Lanka and the Maldives and Deputy High Commissioner, India, with earlier postings to Greece and Bangladesh. He was also Chief of Staff to the former Minister for Foreign Affairs, Alexander Downer. One of the world’s leading institutions focusing on the tropics, James Cook University is surrounded by the spectacular ecosystems of the rain forests of the Wet tropics, the dry savannas, and the iconic Great Barrier Reef. Its unique location enables students from Australia and overseas to study in a diverse physical environment unparalleled by any university in the world. JCU is ranked in the top 2 percent of the world’s tertiary institutions by the respected Academic Ranking of World Universities produced by the Shanghai Jiao Tong University. JCU is a leader in research addressing the critical challenges facing the tropics, world-wide. A defining feature of JCU is its tropical location and its research excellence in disciplines of particular relevance to the tropics. JCU conducts nationally significant and internationally recognised research in areas such as marine sciences, biodiversity, tropical ecology and environments, global warming, tourism, and tropical medicine and public health care in under-served populations. JCU’s aim is to position itself as a national and international leader in teaching and research addressing critical challenges facing the tropics world-wide. As a comprehensive university in the tropics, JCU is well placed to foster cross-disciplinary collaborations to meet these challenges. 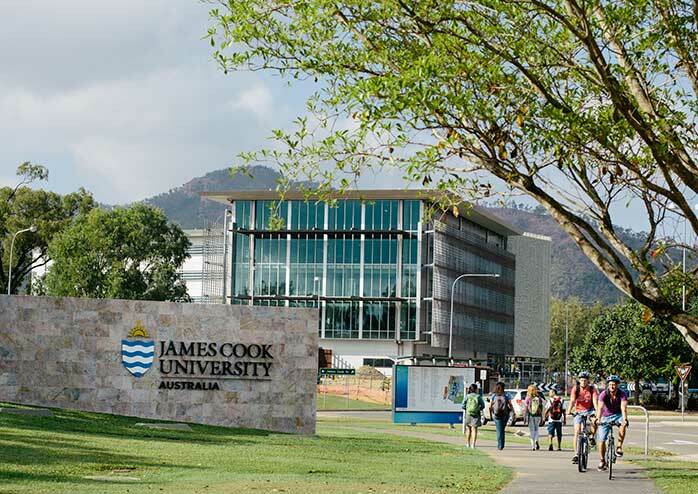 Born of the traditional model of excellence in teaching and research, James Cook University has become a modern and dynamic university of truly global standing. JCU graduates hold top-level positions around Australia and the world, and our research has earned us a world class reputation. Since its establishment in 1970, JCU has expanded into a multi-campus institution with its main campuses in the tropical cities of Cairns, Singapore and Townsville, with smaller study centres in Mount Isa, Thursday Island and Mackay. There is also a Russo Higher Education operated campus in Brisbane. JCU’s students come from many backgrounds, promoting a rich cultural and experiential diversity on campus. JCU’s undergraduate and postgraduate courses span the Arts, Biomedical Sciences, Business, Creative Media, Dentistry, Education, Engineering, Healthcare Sciences, Information Technology, Law, Medicine, Nursing and Midwifery, Pharmacy, Planning, Psychological Science, Science, Social Work, Sustainability and Veterinary Science. JCU aims to give graduates the qualifications and skills they need for the global workforce. As set out in its Statement of Strategic Intent, James Cook University is dedicated to creating a brighter future for life in the tropics world-wide, through graduates and discoveries that make a difference. An international University as reflected in its people, places, and research, JCU takes quiet pride in being recognised as a leading tertiary institution in Australia, the Asia-Pacific region and among the universities of the world. Townsville campus photographer: Andrew Rankin. Since its inception, JCU has become a dynamic, multi-campus university with over 24,000 students. JCU is ranked 38th in the top 150 of the world’s universities under 50 years old (Times Higher Education 150 Under 50 Rankings 2016). JCU is the only Australian institution in Singapore to be recognised with ‘University’ status.